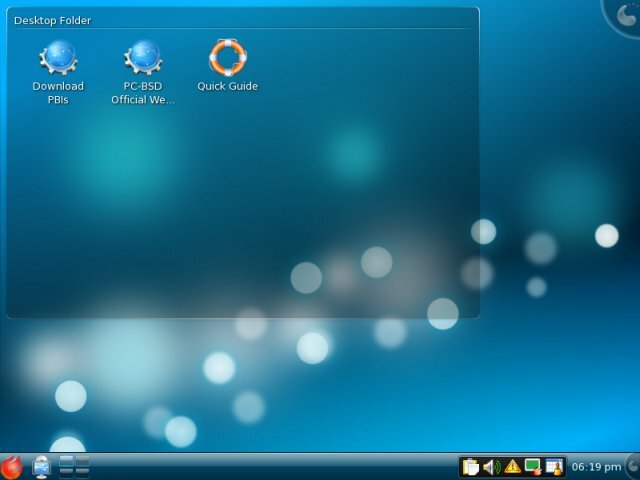 The world of open-source desktop revolves mainly around Linux. Still, there are several other players that you may want to consider as your desktop distribution. One of them is Open Solaris, trying to nibble into the free market with the 2008.11 version, featuring a Gnome desktop. 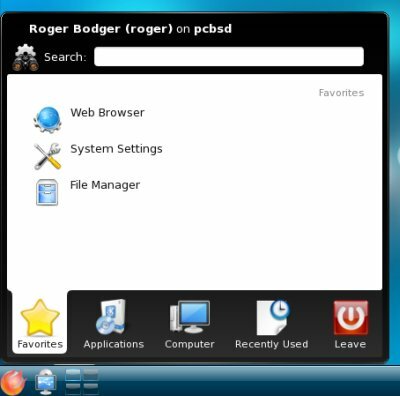 Another one is PC-BSD, a desktop oriented flavor of the UNIX-based BSD operating system. 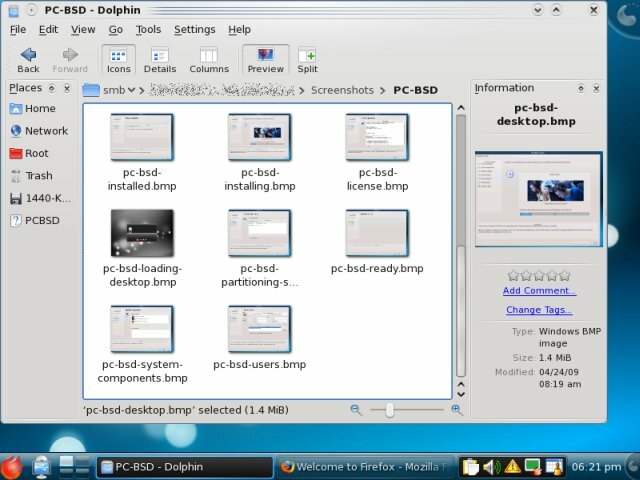 With the recently released Galileo and KDE 4.2.2 environment, PC-BSD is definitely worth testing. I've had my share of experience with PC-BSD before, even before Dedoimedo came to life as a website. Frankly, it has been a pleasant journey. 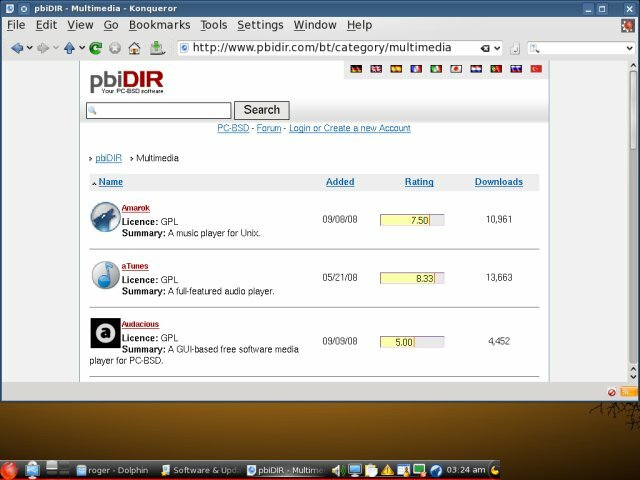 Back then, almost three years ago, PC-BSD looked very beautiful, with smoky, glassy KDE themes that looked stunned in the age of unfulfilled Aero promises. 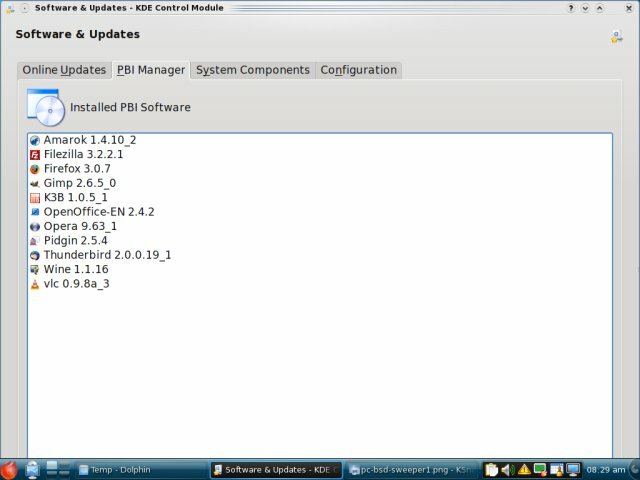 The installation of software was a one-click affair, just as you would do with .rpm or .deb packages. Even stuff like proxy configurations was easy to work out. And the documentation was (is) fabulous. What has changed in three years? 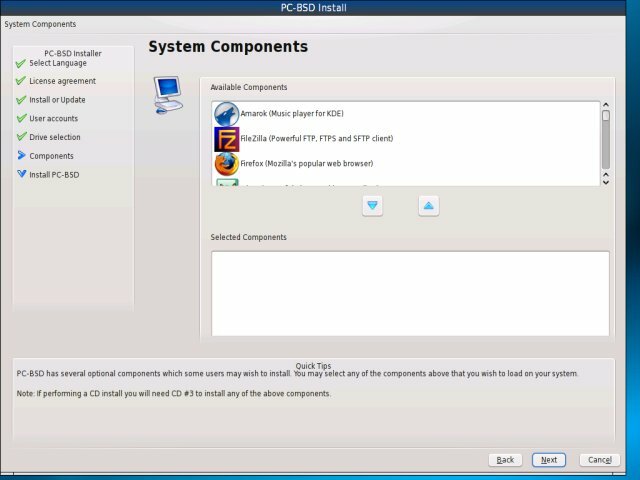 Is PC-BSD good for your desktop? Can it contest the armada of Linux distributions, each trying to best the other? Follow me for a non-Linux spin of PC-BSD. For the review, I downloaded the Complete Install + Optional Components DVD and fired it up as a virtual machine. Unfortunately, PC-BSD does not have a live session, so testing stuff like Wireless, Bluetooth or graphics effect was not possible for me, as I don't have a spare rig to commit PC-BSD to permanently. 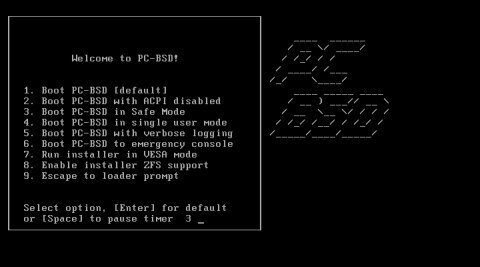 PC-BSD boots using a simple text bootloader featuring mind-blowing command-line graphics. 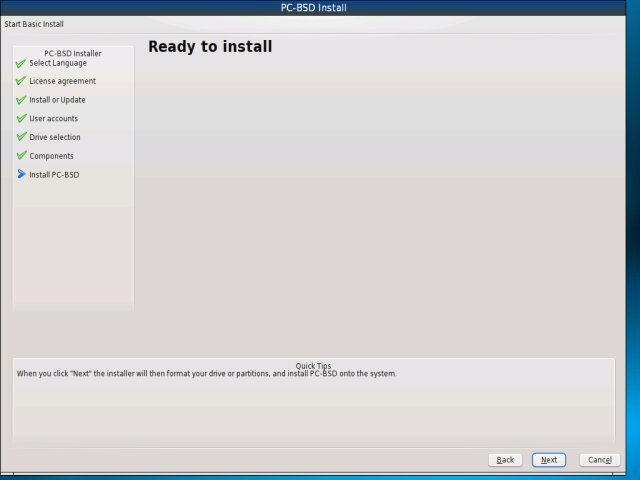 After a while, you will reach the installation menu. The menu runs in 1024x768px resolution and is somewhat reminiscent of the openSUSE installation, color- and font-wise. However, the layout is somewhat jumbled. The first steps would be to choose language, keyboard settings and timezone. Installation source is an interesting step. 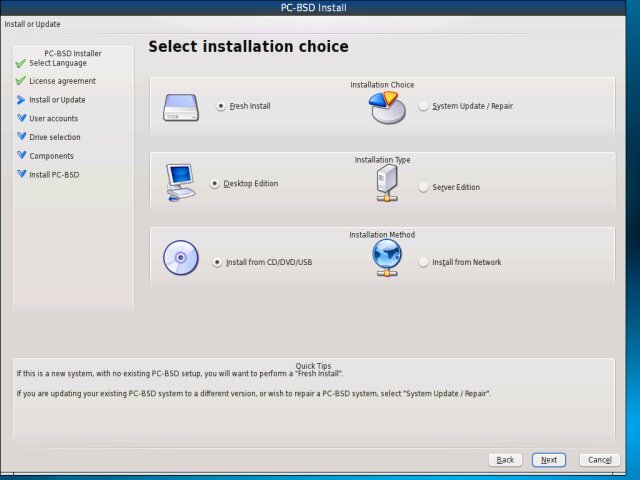 PC-BSD allows you to either freshly install or upgrade/repair an existing edition. 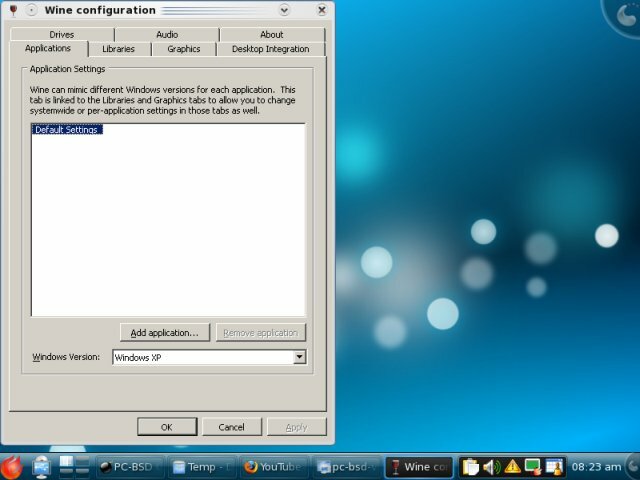 Furthermore, you can choose between the desktop and server, as well as the method of obtaining the packages. We'll go with the CD/DVD/USB, although you can also perform a network install. The next step is to configure users. This is no different from what you've seen with dozens of other Linux distributions. The one change is the choice of the shell. 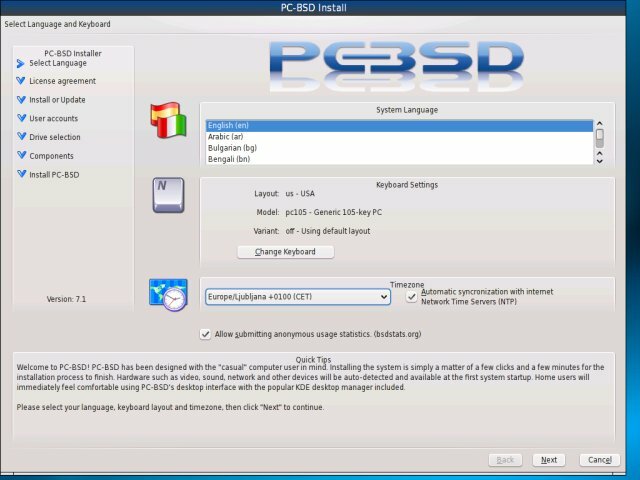 PC-BSD does not use Bash by default, although it is available. 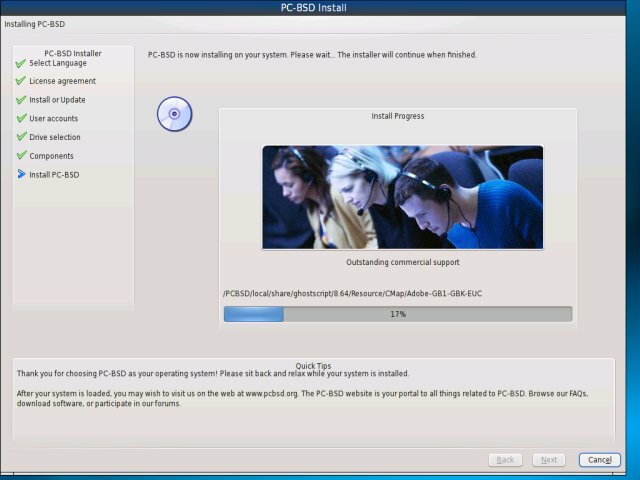 This is the critical step of the installation. If you've read my GParted tutorial, you should have no qualms about this. 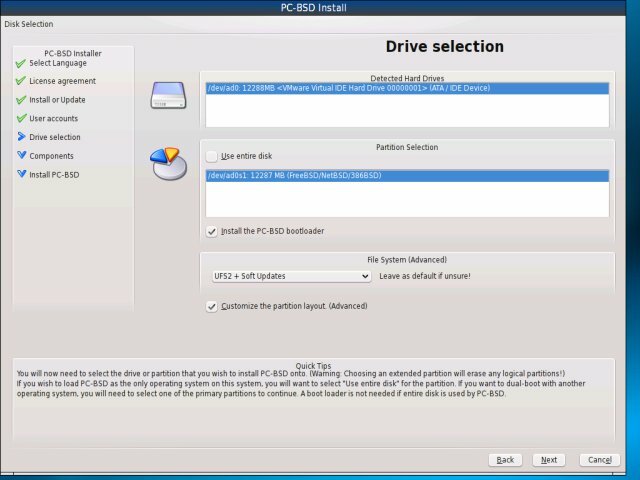 However, PC-BSD uses a different disk notation from what you're used to in Linux, so some caution is necessary. You have to select the drive first. Only then will the second box be enabled. If you choose to use the entire disk, you can move on to the next step. 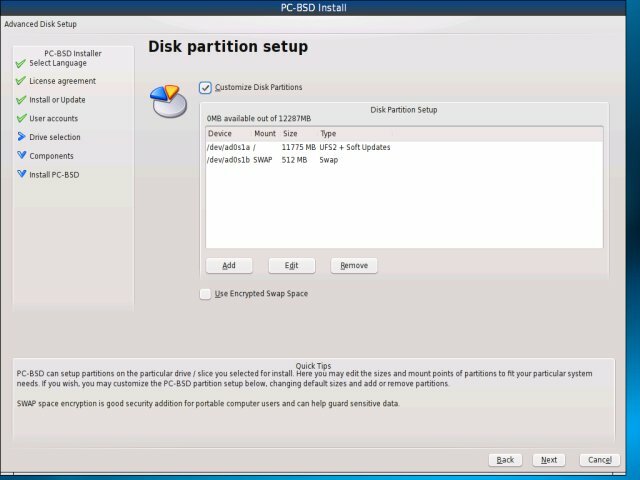 Customize the partition layout is meant for Advanced users. Nevertheless, we will take a look at it, just in case. PC-BSD uses the UFS filesystem, which sounds very alien to Linux users. If you're not familiar with its internals, leave the default selection be. Installing the bootloader is recommended, unless you plan on using GRUB and invoking PC-BSD with it. The disk (and its single partition) was too small. 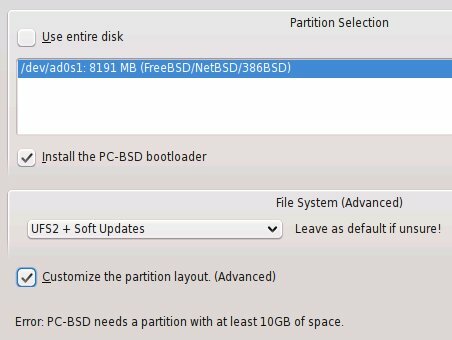 PC-BSD requires at least 10GB of space. This is a hefty requirement compared to most Linuxes. At this stage, I was forced to shut down the virtual machine and create a new, larger disk. Then, I repeated all of the steps above. I chose to customize the layout, just to see what it feels and looks like to what I'm used, namely Linux. Overall, things looked similar to what we've seen many times before. The next step is to choose additional System Components. This is a very nice feature. 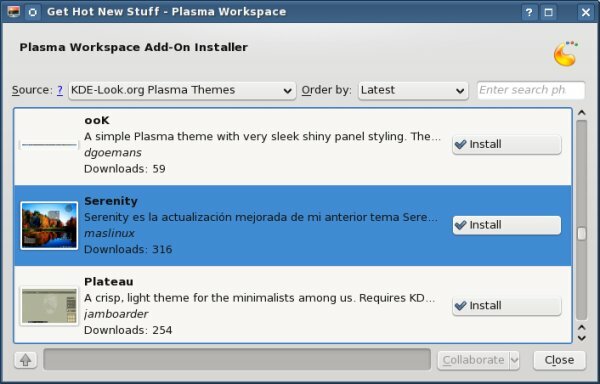 You can install your system with the default set of KDE programs - or install popular stuff like Firefox, FileZilla, OpenOffice, Amarok, VLC, and other software. If you're installing with CDs, rather than the complete DVD, you'll need the third CD for this task. Unfortunately, the installer got stuck at 51% with an unrecoverable error. I had to reboot once more and repeat the setup. The third time it worked as intended. The installation took about 45 minutes to complete, longer than most Linux distros. This did not work as expected. Selecting 1024x768 caused Xorg to hiccup and shrink the display to 800x600px resolution. I decided to let it be for now and proceeded into the desktop. 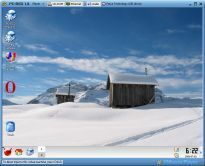 Like most KDE 4.2 desktops, PC-BSD features a soft, slightly fuzzy blue color scheme, with rounded edges and a wallpaper that looks like an evening traffic jam seen through a blue filter in the middle of a winter haze. 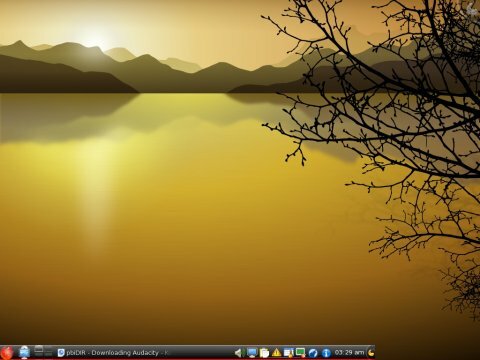 Overall, it looks well, although I find the plasma and the blurriness slightly archaic for modern desktops. But this has nothing to do with PC-BSD. Now, let's see what it can do for us! Before I could test support for MP3 and my Moron video, I had to connect to a Window machine and pull the files off it. Clicking on Network or going via Go > Network in the Dolphin file manager did not work as expected. I could see the Samba shares icon, but when I clicked on it, nothing happened. However, typing the IP address into the address field worked well. I grabbed the files I needed and fired them up. There were no bad surprises here. 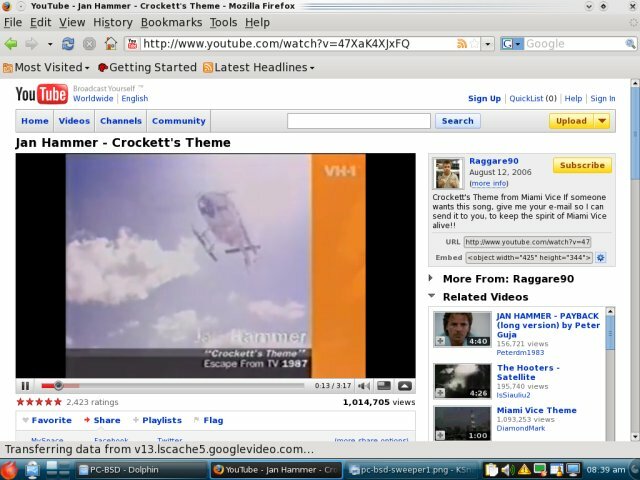 MP3 and Windows video played nicely. 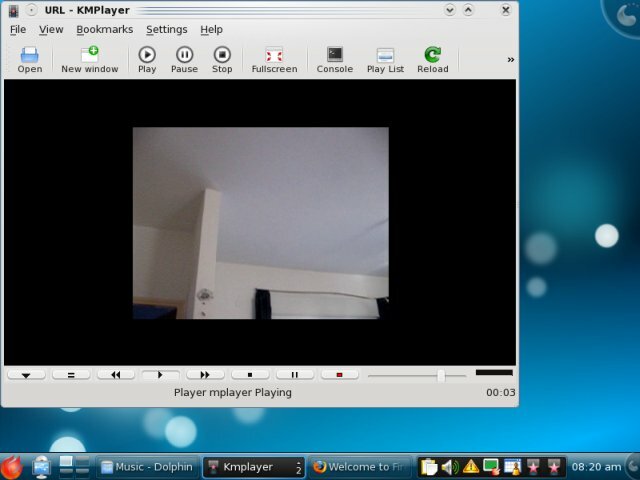 KMPlayer also had no issues with MP3, except the player was devoid of any effects when it played the music. However, it does compensate with a very large selection of online stations, allowing you to stream lots of great stuff inside the player, without leaving the comfort of the desktop. And soon thereafter, everything was working as expected. I must say I'm not very pleased with how KDE 4.2 feels, at least on PC-BSD. The default theme feels bland, with bad contrast that makes it hard to differentiate between active and inactive windows. Furthermore, the windows decorations also felt cheap, a far cry from the stylish KDE 3 glassy looks I've remembered from three years ago. The resolution was horrible. Even the rather standard 1024x768 was too small for most menus. 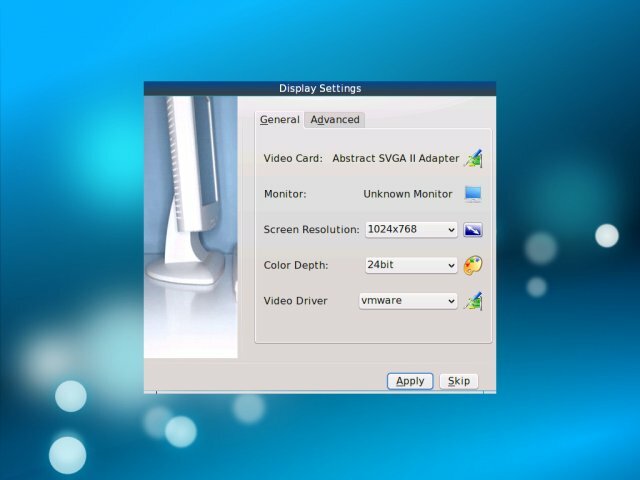 The menus would extend beyond the limitations of the screen, with crucial parts, usually the bottom half with Apply, OK and Cancel buttons hidden from the user. 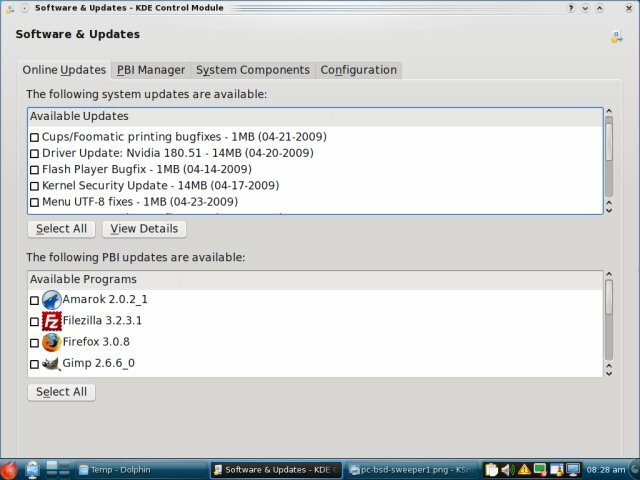 The most glaring example of this was the Software & Updates menu, the critical bit that lets you update your system. I was only able to get it working under 1650x1050px resolution, as the important buttons were unreachable. However, changing resolution was at least possible, unlike during the initial setup, where the procedure failed. Not all is lost, though. 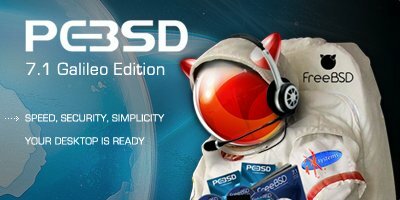 PC-BSD has some aces up its sleeves. The start menu, or the K menu, is styled nicely in black, offsetting the blue smear of the desktop. The notifications also look very neat. 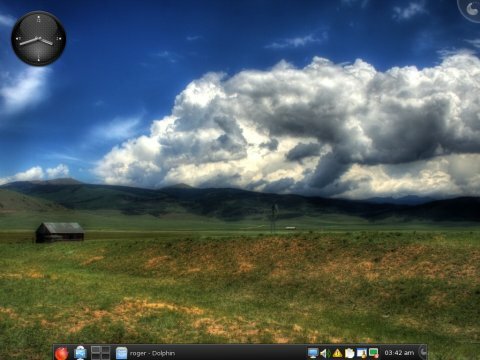 With a bit of work browsing through countless KDE menus, it is possible to get the desktop looking as you intend. The humongous fonts can be resized, the windows decorations changed to something more reasonable and the default wallpaper switched, so you have a presentable desktop to worth with. 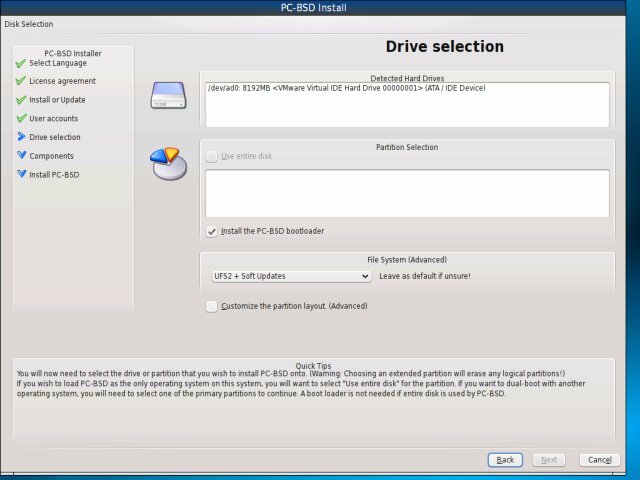 A big question arising is how simple would it be to get new software in PC-BSD. The answer is: very easy. The desktop (plasma) icon Download PBIs is what you need. 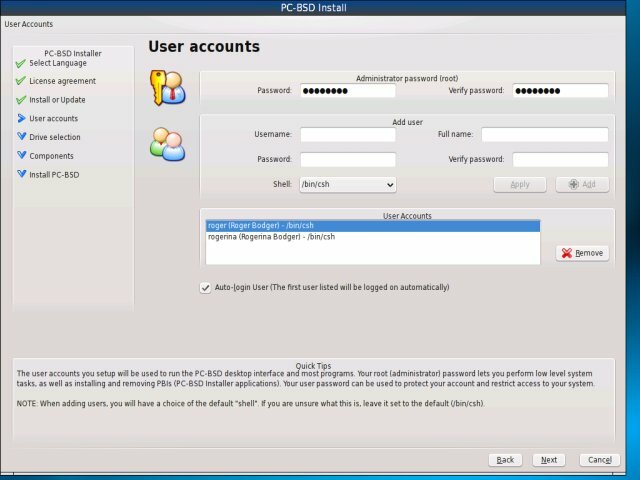 It's a link to an online repository of self-installable packages a-la RPM or DEB, allowing you to download and install new software in just one double-click. The fonts are still huge and the menus are overlapping, a sore issue with KDE when it does happen, but we had the application installed, with no more or less fuss than in Windows or Linux. 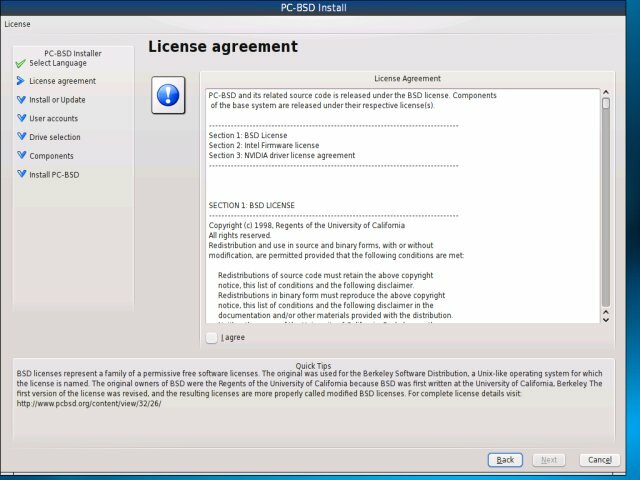 PC-BSD comes with a solid array of programs. 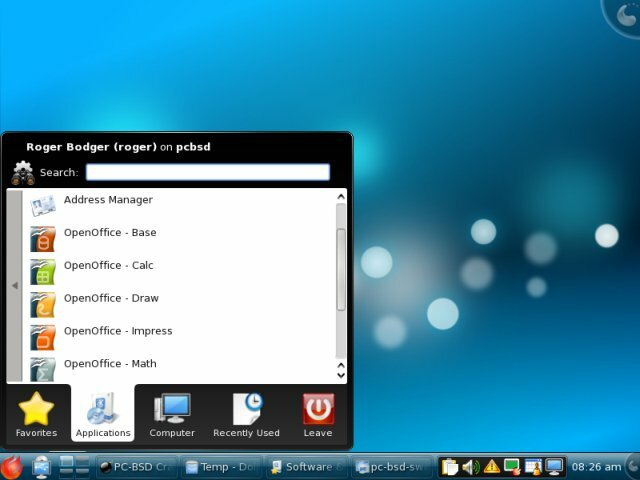 You also get some unique programs, like Wine or Sweeper, which is used to keep the system tidy. Overall, the collection is well balanced, if somewhat thin for a 1.9GB DVD, compared to what most Linux distros deliver in a CD size. PC-BSD behaved nicely, even on the slim 512MB RAM, which was a bit sparse for the KDE 4.2 environment. Nevertheless, it was stable and robust, the hallmark of the BSD family. Furthermore, the collection of programs was good and well-balanced overall, with NTFS and multimedia support out of the box. In fact, the biggest downside of the release is not PC-BSD itself - it's KDE. 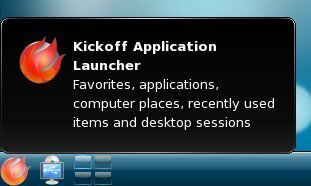 With a few plasma crashes and lots of theming & fonts issues, it somewhat spoiled the experience of a streamlined, solid operating system. The installation was problematic, though. The lack of a live CD is another downside. 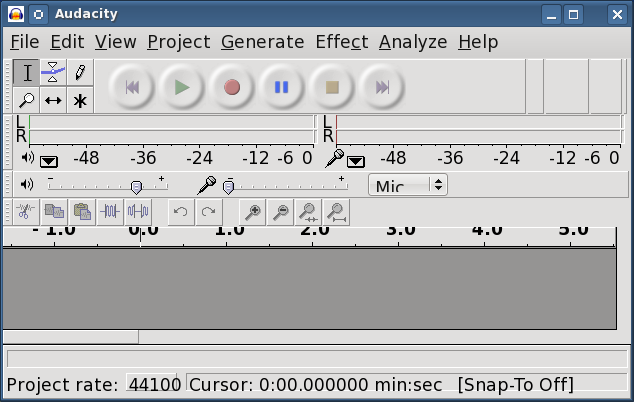 Display settings and resolution issues with the menus, windows, fonts, and overall integration with non-native KDE application need to be fixed. Taking all the bits together, PC-BSD Galileo is a nice overall desktop system. It's not stunning or remarkable, but it's definitely not a failure. If you've expected an archaic BSD monster that slaves you to the command line, forget it; you'll be most pleasantly surprised. The best term would be to say that Galileo is classic, which is to be expected, since BSD has always held stability and security first and foremost, before innovation or gimmicks. Nevertheless, classic does not mean old, since PC-BSD 7.1 handles the modern tricks expected of a desktop system quite well. 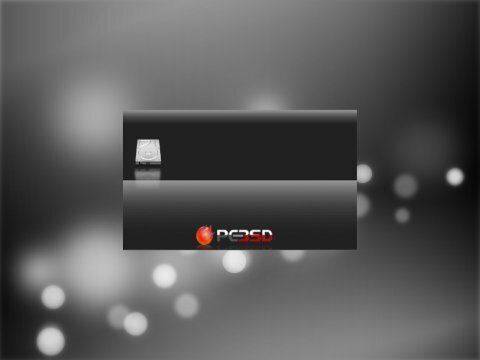 PC-BSD is a good choice for a desktop. Just remember it's not Linux and you'll be fine. P.S. This tutorial was asked for by Mark and aseb1; there you go, guys!